Last summer I went to the Amalfi Coast. The one dish everyone was telling me I had to try was pasta vongle – pasta with clams. I had it a few times when I was there and at one restaurant they added slices of zucchini to the pasta which was quite nice. So I thought, why not use half the amount of pasta and add zucchini noodles instead. It was delicious and with the zucchini noodles you don’t even notice that you are eating less pasta. Put a pot of water on to boil. Add the salt to the water. Once boiling add your pasta and boil according to the directions on the box (about 8 minutes). Meanwhile, mince the garlic, chop the shallots, and finely slice the parsley stalks. Roughly chop the parsley leaves and set aside. Put a large pan with a lid on medium heat. Add oil, garlic, shallots, red pepper flakes, and parsley stalks. Fry for a few minutes until shallots are softened. Add a pinch of salt and pepper. Add clams and pour in the wine and lemon juice and cover. Give it a good shake while covered to get the clams moving and steaming. Keep shuffling the pan around every so often until all the clams have opened. Turn off the heat. Get rid of any clams that haven’t opened. Add the zucchini noodles and stir gently. By now your pasta should be ready. Drain and add to the pan of clams along with the parsley leaves, lemon zest, and an extra drizzle of olive oil. Stir for another minute and serve. I use linguine because it’s about the same thickness of the zucchini noodles, but you can use any kind of string pasta. This is a made to order dish. It doesn’t keep well. But it’s so good I doubt you would have leftovers. This was the perfect Summer pasta. 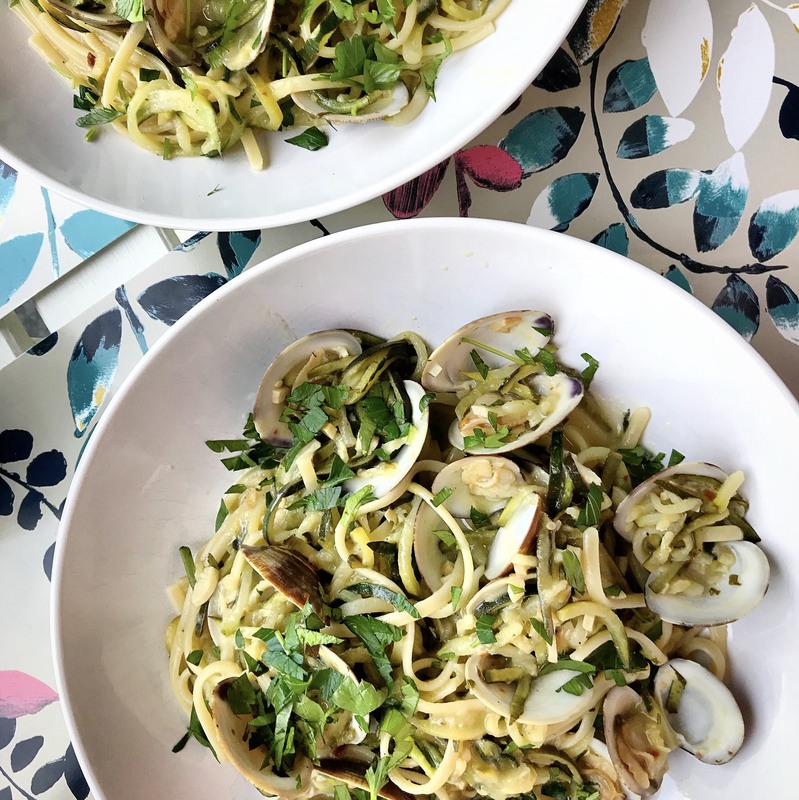 The combination of zucchini noodles with linguine noodles provided the perfect balance; the zucchini lightened the dish and the linguine added that texture and flavour we are all accustomed to and love. Never thought to mix them together…good thinking 💡!